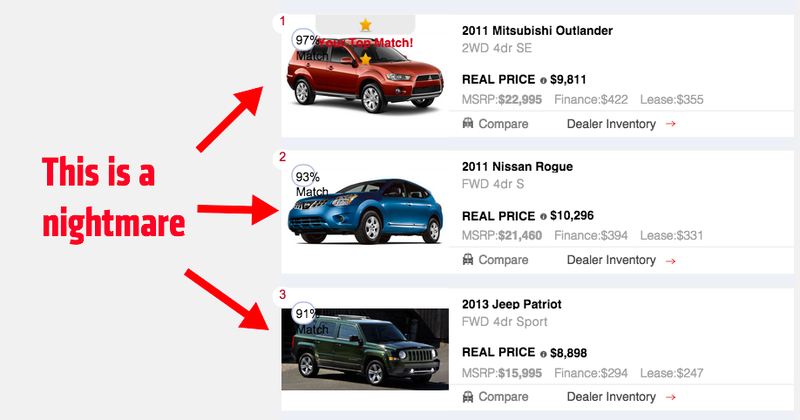 Car buying site Carhub just sent us a new car-matching quiz based on what it calls an “Advance Algorithm Personality Test.” But don’t fall for any of that fancy mumbo-jumbo—the test is total poppycock, I tell you! (That’s right, I said poppycock. I’m going there.) There’s just no way my inner psyche yearns for these awful shitboxes. Right? I took the test, and the results burned a hole into my soul (see the topshot). An Outlander and a Rogue I can almost excuse. Actually, no I can’t, but I will for now because of what’s sitting in the third position: A Jeep Patriot. It matched me with a Jeep. Patriot. Everyone knows of my deep and abiding love for Jeeps, but... that Jeep? This changes everything. All my life, I was unaware that I was subconsciously yearning for one of the shittiest cars of our millennium— the very embodiment of the dark era of Chrysler. Carhub says CarTron is “science-based,” and “100 percent guaranteed to be impartial.” How can I argue with that? Take this test at your own risk, because you may not like what you see.